Tired of looking up an emoji symbol on other websites? Let's save time, shall we? I've developed a handy Chrome extension called "SteemIt Smile!". 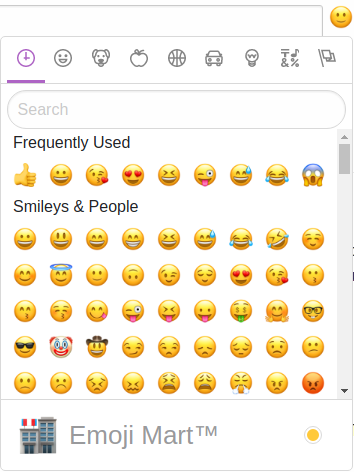 It allows you to insert an emoji to comments in an incredibly simple way. Click "+ Add to Chrome"
@Ansek I published the post in Italian, quoting the source obviously, I hope it's not a problem ..
Haha, thanks! 😜 I have several services in my mind but I didn't have the right incentive to do them because my mind was occupied by things like moving to another country. Now, I think I could do them just like that and see what happens. Definitely worth getting it out there mate, people love to have things to make their life easier haha. This post has received a 4.63 % upvote from @buildawhale thanks to: @ansek. Send at least 0.50 SBD to @buildawhale with a post link in the memo field for a portion of the next vote. The @OriginalWorks bot has determined this post by @ansek to be original material and upvoted it! This wonderful post has received a bellyrub 1.54 % upvote from @bellyrub thanks to this cool cat: @ansek. My pops @zeartul is one of your top steemit witness, if you like my bellyrubs please go vote for him, if you love what he is doing vote for this comment as well. This post received a 1.6% upvote from @randowhale thanks to @ansek! To learn more, check out @randowhale 101 - Everything You Need to Know!